National Agricultural Research Centre, Islamabad, Pakistan. 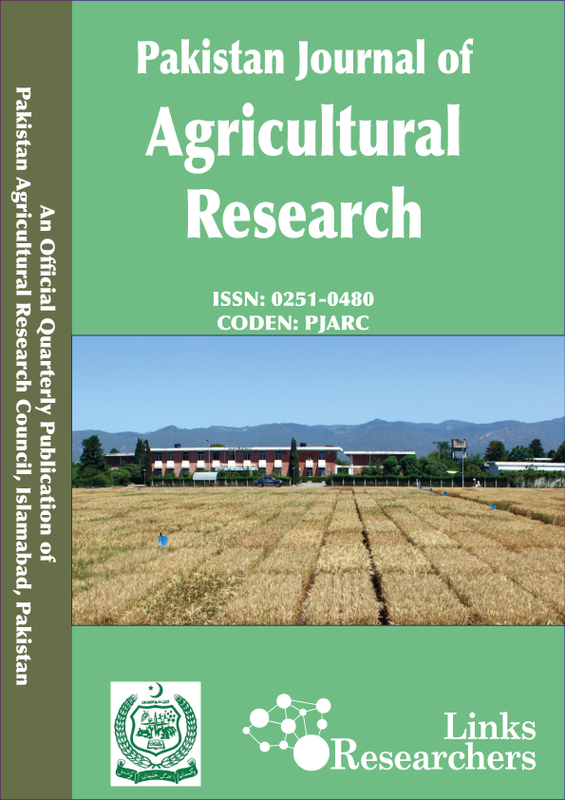 The experiment comprised 98 local sesame genotypes including a standard cultivar (TS-3), was conducted during the Kharif seasons of 2011 and 2012 in the research fields of Oilseeds Research Program, Crop Sciences Institute, National Agricultural Research Center, Islamabad, Pakistan. Data were recorded on days to flower initiation, days to flower completion, reproductive period, days to maturity, pod filling period, plant height (cm), number of branches per plant, number of pods per plant, seed yield (kg/ha). Seed yield ranged from 352 to 878 kg/ha with a mean value of 521 kg/ha. A total of forty genotypes produced more seed yield than standard cultivar (517 kg/ha) with a range of 524 to 878 kg/ha. Maximum variation was showed by pods per plant, seed yield, branches per plant, pod filling period and plant height. Dendrogram based on Euclidean distance coefficient, using 9 quantitative traits, grouped 98 sesame genotypes in to 6 lineages and 29 clusters. Cluster 25 had the maximum number of genotypes i.e. 18 followed by Cluster 23 (14 genotypes), 19 (12 genotypes) and 9 (9 genotypes). There was a wide range of genetic diversity in this set of sesame germplasm which could be utilized for crop improvement. It is further recommended that for making improvement in sesame crop, identified superior sesame lines viz. SG-115, SG-103, SG-78, SG-79, SG-31, SG-117, SG-108, SG-41 and SG-1 could be used in breeding program and further by making selections in segregating generations. This will help to increase sesame crop yield in the country.